MOFIDI, M. , HAJGHASSEM, H. , AFIFI, A. Access to the fine spatial resolution has always been a hotspot in digital imaging. One way to improve resolution is to use signal post-processing techniques. In this study, an improved multi-frame image super-resolution (SR) algorithm is proposed. The objective function should be minimized consists of a data error term, a regularization term and a regularization parameter. Based on the bilateral-total-variation (BTV) regularization, in the proposed method on one hand, the data error term incorporates frames with high accuracies in the reconstruction process, where an indicator weights each frame proportional to the frame error. On the other hand the regularization parameter is updated in each iteration based upon the Morozov's discrepancy principle. Iterative adjustment of the regularization parameter guarantees the SR solution to satisfy discrepancy principle. Visual evaluation and also quantitative measurements show that the performance of the proposed algorithm is better than of the several state-of-the-art methods. S. C. Park, M. K. Park, M. G. Kang, "Super-resolution image reconstruction: a technical overview," IEEE Signal Process. Mag., vol. 20, no. 3, pp. 2136, May 2003. M. N. Bareja, C. K. Modi, "An improved iterative back projection based single image super resolution approach," Int. J. Image Graph., vol. 14, no. 04, p. 1450015, Oct. 2014. T. Lukes, K. Fliegel, M. Klima, "Objective image quality assessment of multiframe super-resolution methods," in Proc. 23rd International Conference Radioelektronika, Czech Republic, 2013, pp. 267272. T. Wang, L. Cao, W. Yang, Q. Feng, W. Chen, Y. Zhang, "Adaptive patch-based POCS approach for super resolution reconstruction of 4D-CT lung data," Phys. Med. Biol., vol. 60, no. 15, pp. 59395954, Aug. 2015. P. Vandewalle, L. Sbaiz, J. Vandewalle, M. Vetterli, "Super-resolution from unregistered and totally aliased signals using subspace methods," IEEE Trans. Signal Process., vol. 55, no. 7, pp. 36873703, Jul. 2007. M. K. Ng, A. C. Yau, "Super-resolution image restoration from blurred low-resolution images," J. Math. Imaging Vis., vol. 23, no. 3, pp. 367378, Nov. 2005. M. Shen, C. Wang, P. Xue, W. Lin, "Performance of reconstruction-based super-resolution with regularization," J. Vis. Commun. Image Represent., vol. 21, no. 7, pp. 640650, 2010. L. T. Shao, H. G. Zhang, G. H. Zhang, "The improved hybrid MAP-POCS based algorithm for super-resolution image restoration research," Appl. Mech. Mater., vol. 701702, pp. 373380, Dec. 2014. S. D. Babacan, R. Molina, A. K. Katsaggelos, "Parameter estimation in TV image restoration using variational distribution approximation," IEEE Trans. Image Process., vol. 17, no. 3, pp. 326339, Mar. 2008. P. Milanfar, "Super-Resolution Imaging", pp. 9-23, CRC Press, 2011. V. Patanavijit, S. Jitapunkul, "A robust iterative multiframe super-resolution reconstruction using a Huber bayesian approach with Huber-Tikhonov regularization," in Proc. 2006 International Symposium on Intelligent Signal Processing and Communications, Yonago, Japan, 2006, pp. 1316. V. Patanavijit, S. Jitapunkul, "A robust iterative multiframe super-resolution reconstruction using a bayesian approach with Tukeys biweight," in Proc. 2006 8th international Conference on Signal Processing, Beijing, China, 2006. V. Patanavijit, S. Jitapunkul, "A lorentzian stochastic estimation for a robust iterative multiframe super-resolution reconstruction with Lorentzian-Tikhonov regularization," EURASIP J. Adv. Signal Process., vol. 2007, no. 1, p. 034821, 2007. A. A. Hefnawy, "An efficient super-resolution approach for obtaining isotropic 3-D imaging using 2-D multi-slice MRI," Egypt. Informatics J., vol. 14, no. 2, pp. 117123, 2013. Q. Yuan, L. Zhang, H. Shen, "Regional spatially adaptive total variation super-resolution with spatial information filtering and clustering," IEEE Trans. Image Process., vol. 22, no. 6, pp. 23272342, Jun. 2013. S. Farsiu, M. D. Robinson, M. Elad, P. Milanfar, "Fast and robust multiframe super resolution," IEEE Trans. Image Process., vol. 13, no. 10, pp. 13271344, Oct. 2004. V. Moram, S. D. Cabrera, "Superresolution using the optimal recovery framework with automatic generalized cross-validation," in Proc. Digital Signal Processing and Signal Processing Education Meeting (DSP/SPE), USA, 2011, pp. 344349. H. Z. Wang, S. Zhao, H.W. Lv, "Super-resolution image restoration with L-Curve," in Proc. 2008 Congress on Image and Signal Processing, China, 2008, pp. 597601. Q. Yuan, L. Zhang, H. Shen, P. Li, "Adaptive multiple-frame image super-resolution based on U-curve," IEEE Trans. Image Process., vol. 19, no. 12, pp. 31573170, Dec. 2010. V. A. Morozov, "Methods for Solving Incorrectly Posed Problems", pp. 32-153, Springer Press, New York, 1984. D. Krawczyk-Stando, M. Rudnicki, "Regularization parameter selection in discrete ill-posed problems - the use of the U-Curve," Int. J. Appl. Math. Comput. Sci., vol. 17, no. 2, pp. 157164, Jan. 2007. Y. W. Wen, R. H. Chan, "Parameter selection for total-variation-based image restoration using discrepancy principle," IEEE Trans. Image Process., vol. 21, no. 4, pp. 17701781, Apr. 2012. C. He, C. Hu, W. Zhang, B. Shi, "A fast adaptive parameter estimation for total variation image restoration," IEEE Trans. Image Process., vol. 23, no. 12, pp. 49544967, Dec. 2014. M. V Afonso, J. M. Bioucas-Dias, M. A. T. Figueiredo, "An augmented lagrangian approach to the constrained optimization formulation of imaging inverse problems," IEEE Trans. Image Process., vol. 20, no. 3, pp. 681695, Mar. 2011. P. Purkait, B. Chanda, "Super resolution image reconstruction through bregman iteration using morphologic regularization," IEEE Trans. Image Process., vol. 21, no. 9, pp. 40294039, Sep. 2012. 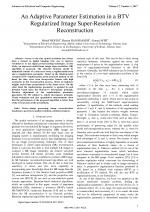 A. Panagiotopoulou, V. Anastassopoulos, "Regularized super-resolution image reconstruction employing robust error norms," Opt. Eng., vol. 48, no. 11, p. 117004, Nov. 2009. X. Zeng, L. Yang, "A robust multiframe super-resolution algorithm based on half-quadratic estimation with modified BTV regularization," Digit. Signal Process., vol. 23, no. 1, pp. 98109, Jan. 2013. H. Song, L. Qing, Y. Wu, X. He, "Adaptive regularization-based spacetime super-resolution reconstruction," Signal Process. Image Commun., vol. 28, no. 7, pp. 763778, Aug. 2013. J. F. Aujol, G. Gilboa, "Constrained and SNR-based solutions for TV-Hilbert space image denoising," J. Math. Imaging Vis., vol. 26, no. 12, pp. 217237, Nov. 2006. A. Panagiotopoulou, V. Anastassopoulos, "Super-resolution image reconstruction techniques: trade-offs between the data-fidelity and regularization terms," Inf. Fusion, vol. 13, no. 3, pp. 185195, Jul. 2012. B. Setiyono, M. Hariadi, M. H. Purnomo, "Survey of super-resolution using phased based image matching," Journal of Theoretical and Applied Information Technology, Vol. 43, pp. 245-253, Sep. 2012. J. Immerkær, "Fast noise variance estimation," Comput. Vis. Image Underst., vol. 64, no. 2, pp. 300302, Sep. 1996. Z. Zheng Liu, R. Laganiere, "On the use of phase congruency to evaluate image similarity," in Proc. 2006 IEEE International Conference on Acoustics Speech and Signal Processing Proceedings, France, 2006, pp. II937II940. Z. Wang, A. C. Bovik, H. R. Sheikh, E. P. Simoncelli, "Image quality assessment: from error visibility to structural similarity," IEEE Trans. Image Process., vol. 13, no. 4, pp. 600612, Apr. 2004. X. Zhu, P. Milanfar, "Automatic parameter selection for denoising algorithms using a no-reference measure of image content," IEEE Trans. Image Process., vol. 19, no. 12, pp. 311632, Dec. 2010. N. D. Narvekar, L. J. Karam, "A no-reference image blur metric based on the cumulative probability of blur detection (CPBD)," IEEE Trans. Image Process., vol. 20, no. 9, pp. 26782683, Sep. 2011. 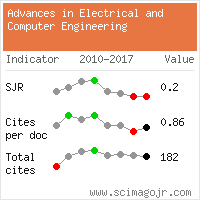 Citations for references updated on 2019-04-20 08:46 in 230 seconds.